In case you haven’t noticed, WindowsWave has been on hiatus since December. We launched this website around the time Microsoft launched its new Surface tablet, but sales of that device have been rather lackluster. Moreover, the tablet has an expensive price tag and suffers from a number of performance issues. While we continue to debate where we will take WindowsWave in the future, be sure to check out iFans.com in the meantime. You’ll find our complete writing staff — Stephen Hall, Thuc Nguyen and I — on that website, a leading online iPhone, iPad and iPod touch community with over 175,000 registered members. Thanks to everyone that was part of the early audience here at WindowsWave, as we truly appreciate the readership. This isn’t the last time you’ll hear from us, so check back periodically to see what we have in store. We’ll push forward with something, but exactly what remains a mystery at this point. We, like BGR, see potential in the surface. But some industry analysts are already calling it a failure. With orders cut in half short after launch, the tablet received mass criticism from most online publications. The tablet was already off to a rough start, but today’s news from Forbes is making the situation look even worse. Boston-based brokerage firm Detwiler Fenton has now said that the Microsoft Surface will sell less than a million devices before the end of Q4 2012. This is a scary thought for Microsoft if they want to compete with the iPad — Apple sold 17 million iPads in Q3 2012 alone. Forbes revealed numbers from Detwiler Fenton predicting that the Surface might sell between just 500,000 and 600,000 Surfaces for the holiday-shopping month of December. That’s awful. Sources for Tom Warren of The Verge have said that Microsoft “plans to introduce a low-cost alternative to its Xbox console, designed to provide access to core entertainment services.” The move to create a cheaper, Xbox-branded device would in theory increase Microsoft’s presence in the living room and would compete with products such as the Apple Tv and the Boxee box. This put together with the other Xbox ecosystem rumors we have heard lately will no doubt make an exciting year for Microsoft in 2013. The Xbox line of consoles, the Surface Pro, and the entire new Windows ecosystem that Microsoft has built really exemplify that they intend to compete this year — on all levels, not just the business world and not just gamers. The “Xbox TV” is a new branch, the Surface is a new branch, and Windows 8 itself running on touch-screen PCs are great examples of the new direction Microsoft is taking. A new security hole has been discovered in Microsoft’s product activation process that allows pirates to get a free legitimate activation of Windows 8 using the current Windows Media Center upgrade promotion. Pirates have been having a harder time with Windows 8 because beginning with Vista, Server 2008, and Office 2010, every installation, even those using volume-licensed media and a volume license product key, must be activated. [Thanks, “Joe M.”] However, a hole was discovered that involves using the KMS (Key Management System) , and then applying the freely available Windows Media Center upgrade on top of it. Essentially, those who wish to get a free legitimate installation only need a key for the Windows Media Center upgrade, which is available directly from Microsoft. They simply use any Windows 8 key to reach the desktop during installation of a pirated copy of Windows 8, apply a KMS activation for their current version (to prevent piracy we will not be covering this step in detail), and then go on to use the Windows Media Center upgrade key they obtained from Microsoft themselves. Due to the fact that the WMC upgrade process does no checks for the validity of the activation, any activated copy of windows (even ones which were activated via KMS) are upgraded to a valid version of Windows 8 via the WMC upgrade. Uh oh! A Key Management System activation allows your unlicensed copy of Windows to be fully usable for 180 days. It’s typically used to help Volume Licensing customers automate and manage the activation process, but pirates have found a way to take advantage of it. On top of that, Microsoft is simply handing out unlimited upgrade keys for Windows Media Center, providing a gateway to free activations. When you activate Windows via KMS, in the activation window it says “Windows is activated until…” and a date (so if you were to install it today, it would say it’s activated until May). After installing the upgrade, the window just says “Windows was activated on…” and the date of activation. That means the activation is permanent. When you install the upgrade key, that replaces the existing product key; only the new upgrade key is used for future checks. Windows won’t check the key you used to install because it no longer has it. I already have Windows 8 installed on my main machine, but another editor here at WindowsWave tested it out after he came across the Reddit article and it was successful. Luckily, the promotion period for the free upgrade ends in January, so the damage that could potentially be done by pirates within the next month and a half is probably minimal. A new report from The Guardian claims that the Touch Cover for the Microsoft Surface has a design flaw that causes the top of the accessory to split, revealing the wiring that connects the cover to the tablet. The report notes that a number of customers, including Tom Warren for The Verge, have experienced the problem. Microsoft has been replacing faulty covers with new ones for customers at its retail stores while it looks into the issue. The problem has been reported in both the United Kingdom and United States, indicating that this problem is not isolated to one part of the world. It is unknown if all Touch Covers suffer from fraying, or if the problem only affects a certain batch of covers. The report adds that the splitting appears to be the result of mechanical stress on the cover. If and when Microsoft officially addresses the dilemma, we’ll update this post accordingly. When installing my upgrade copy of Windows 8 I was confronted with the familiar screen listing all of the applications that I couldn’t bring with me. One of these was DAEMON Tools lite, a free program used to mount ISO images (disk images) as temporary drives in Windows. I of course uninstalled it without question, because I assumed there was some kind of compatibility issue. It turns out that this might not have been the case, however, with the addition of an almost as powerful feature built in to Windows 8. It will definitely get the job done for most. ISO images are typically games, applications, or operating systems like the latest build of Ubuntu. The addition of this feature in Windows 8 allows you to easily burn or directly mount these images without 3rd party software. When highlighting an ISO in File Explorer, you are presented with a new “disk image tools” menu in the ribbon which can perform the two common ISO functions — burning and mounting. Also, you can quickly mount an ISO with a simple double-click. Tired of those old x86 style icons cramping the style of your beautiful Windows 8 start screen? Well, today you’re in luck because deviantArt user dAKirby309 has you covered. This set of over 600 app icons are made to look like Windows 8 tiles and fit in with Microsoft’s app icons that are there by default. With these icons, an app called OblyTile, and just a little work you can have all your desktop apps looking fantastic. This tutorial is going in-depth to show you how to make it happen. Old icons just look out of place next to “Modern Interface” tiles. First of all, you’re going to need to download the icon pack. You can find it here on dAKirby309′s deviantArt page. It’s a 31.5 MB download and should only take a minute or two depending on your internet speed. The pack includes a total of 678 icons for all of the most popular desktop applications, browsers, system icons, and top websites. After you download this, you can use the built-in Windows unzipping application and put the unzipped folder somewhere accessible such as the Desktop. 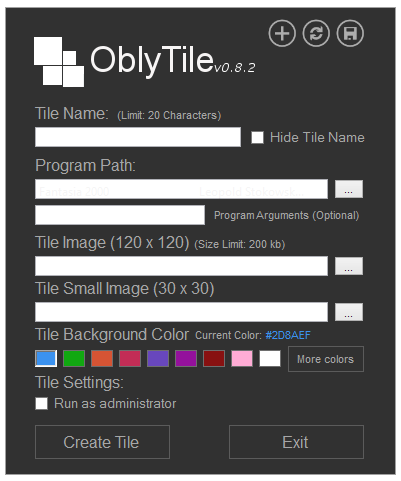 There are many ways of going about making your start screen tiles, but in this case we’re going to use a popular start screen modification application called OblyTile. The app was made by xda-developers.com member Argony-OT and the download for it is available there on this page. OblyTile lets you use images located on your hard disk to easily create Metro — or “Modern Interface” — start screen tiles. Just fill in these blanks for awesome icons! Once you download and run the latest version of OblyTile, you should be presented with a screen identical to or much like the one above. The tile name is the name of the application. What you do want the small label below the tile to say? If you’re creating a tile for Spotify, you probably want it to say Spotify. For “Program Path” you are going to browse for the .exe of the application you are creating the tile for. You most likely need to browse to “Computer” >”Local Disk” (whichever disk Windows is located on) > “Program Files” or “Program Files x86.” You will find a bunch of folders with the names of your Windows applications and the .exe (most likely spotify.exe in this case) will be located directly within the Spotify folder. For both “Tile Image” and “Small Tile Image” choose the tile image that we downloaded earlier for the respective application. For Spotify, I went to the folder that I downloaded earlier and opened “Metro Icons” > “Applications” > “Spotify.png.” They should be organized alphabetically so finding the actual icon shouldn’t prove to be too hard. Simply repeat this step for the “Small Image” selection field. Please note that even though OblyTile asks for 120 X 120 and 30 X 30 images, the 512 X 512 ones we are providing will work anyway because OblyTile will resize them for us. The “Tile Background Color” doesn’t matter in this case because our icons are going to fit perfectly. However, it seems that this setting may alter the color of the shadow when hovering over the tile. I like to choose the color closest to the color of the tile. For example, for Spotify, I choose the green one. If you have followed all of these steps correctly, you should end up with something like the image below. You can repeat all of the above steps for all of your desktop applications, making your Windows 8 start screen appear as it should — beautiful. Also worth noting is that these icons will work great with, and were originally intended for, the popular Windows dock application RocketDock. The artist has provided a matching RocketDock skin as well.